Pin It Now! Congratulations to #3--Tammy and #1--Heather! Thanks for entering. :) Heather, I don't see contact info., and I am not sure which follower you are. Please contact me ASAP! -- a natural product that deodorizes clothing through the power of Activated Carbon. What's so great about this product? First of all, it is natural, which is what initially caught my eye. Also, this product is a space-tested material that refreshes clothes from all kinds of unpleasant odors such as: smoke, food, and perspiration. FRESHhanger has the potential to save you big bucks, too, if you usually spend money on dry cleaning. FRESHhanger is designed to fit right over your hangers. Just hang up your clothes as usual, and let deodorizing begin! 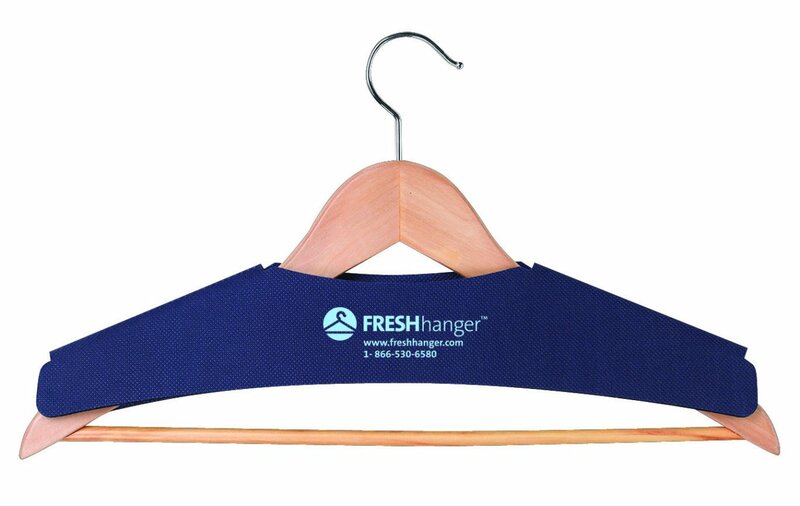 FRESHhanger is fast-working--it reduces odor by 88% in just 4 hours. It's convenient to use and fits hangers of all shapes and sizes. 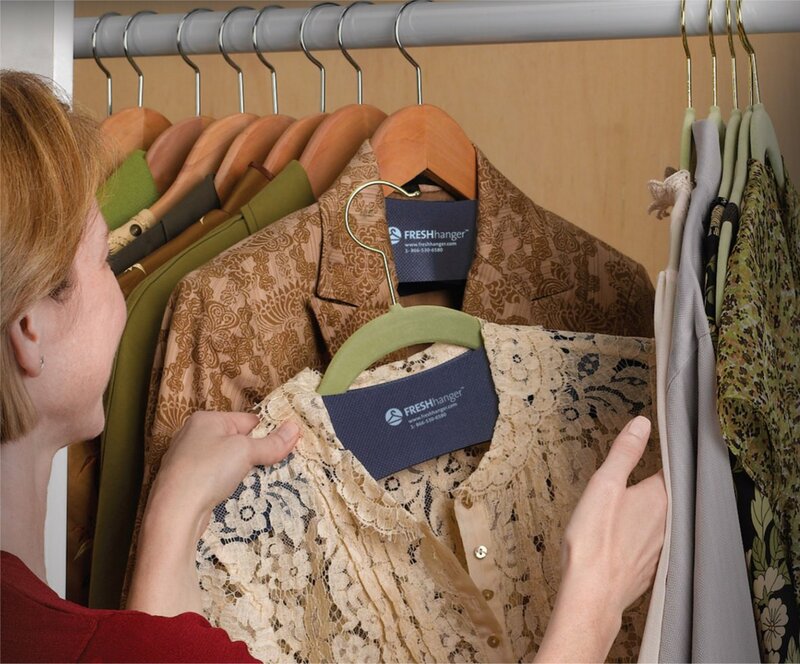 FRESHhanger is fragrance free, so odors are not merely masked. Product should be effective for up to 6 months. To learn more about FRESHhanger and the research behind Activated Carbon, please click the link. I have to admit I was quite surprised at the effectiveness of this product. I was skeptical at first. When I took FRESHhanger out of its package there was absolutely NO smell, so I wondered how in the world it was going to work. It just so happened that when I tried FRESHhanger out for the first time, my husband had returned from a trip to Tennessee where he spent most of his time on the river or near a campfire. Needless to say, his clothes reeked of smoke! Because I use fragrance-free laundry detergent, his clothes didn't smell any better after washing them. So, I thought this was the PERFECT opportunity to test FRESHhanger's claims. I literally sniffed my husband's clothes every single day, and after a few days, I was shocked! The campfire odor was completely gone. I even made my husband sniff to make absolutely sure. His shirt really did smell fresh without harsh scents. His quote to me on the phone when he found out I was writing this post: "Wow, those really do work. When I put my shirt on, I was overwhelmed with freshness!" 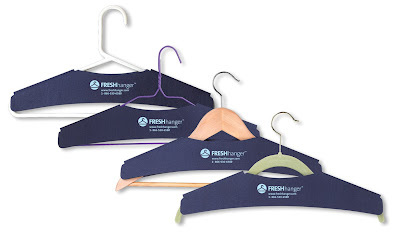 *Since we don't have clothes that need to be dry cleaned, I will be using FRESHhanger for our coat closet this winter. I don't like to wash jackets every time we wear them. Win a package of FRESHhanger to try out for yourself! **I will choose 2 winners on Friday October 22, 12 noon Mountain time. Giveaway is open to U.S. residents only. Please make sure you leave a way for me to contact you if you win! Here's how to enter: First and mandatory entry-- leave a brief comment telling me how you'd use FRESHhanger. ***FRESHhanger is currently available on-line and in Bed, Bath, and Beyond stores in Arizona. Sounds like an ideal hanger to have for those-not-so-fresh garments! 2--I am now a follower! 3--I am now a follower! 4-I am now a follower! 5-I am now a follower! I would use it on my husband's dry clean only items...love how green it is!! I would use this to freshen up the clothes in my closet...I'd also use it LOTS in travelling, as clothes on the road always tend to pick up strange odors.